The compact sports saloon which took the fight to BMW’s 3-Series. 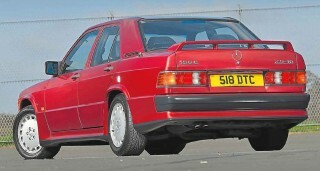 Buyer’s Guide Mercedes-Benz 190E W201. 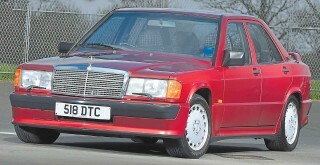 The compact W201-Series 190E saw Mercedes take the fight to BMW’s E30 3-Series in the early ’80s. Its rugged build, tidy driving manners and sharp ’80s style make it a great modern classic today. Matt Bell Staff Writer. Launched in November 1982, the Mercedes-Benz 190E W201 was the first in a long line of compact saloons that would help the company to rescue its finances following the oil crises of the 1970s. Despite being a smaller car than the firm had traditionally produced, quality, safety and reliability were held in the highest regard to ensure that the car would stay true to Mercedes’ core values. Over the course of an 11-year run, Mercedes sold 1,879,629 of the model codenamed W201, which proved that they’d done something right with the 190E. It was sold with a combination of engines, which included four-cylinder 1.8-litre, 2.0-litre, 2.3-litre, 2.5-litre and the six-cylinder 2.6-litre petrol engines, as well as a handful of 3.2-litre variants. On the diesel side of things a 2.0-litre, 2.2-litre and 2.5-litre engine were used with the latter also receiving a turbo option. The UK market received the injected 1.8 and 2.0-litre fours, the 2.6-litre six, plus the Cosworth-developed 2.3-16 which was later replaced by the 2.5-16 and the choice of 2.0 or 2.5 diesel. The Cosworth-developed 2.3-16 and 2.5-16 were range-topping niche models and today are on a different value level from the regular 190E W201. Whether you buy in either petrol or diesel variant you won’t be disappointed as the focus here is primarily on the comfort side of things. That being said, both the 1.8-litre and 2.0-litre petrol engines are considered to be a bit lacklustre in the trouser department to shift the weight of the car at decent pace. The 2.6-litre engine is thirsty, but the resulting increase in power provides a much better overall drive. The diesels are all torquey with the more powerful 2.5 the better bet in modern traffic. As mentioned above, the main brief for the new Mercedes compact saloon was to produce the highest levels of comfort as seen its then-current range and apply them to a car that was built for an affordable market. It stayed true to those values and can be seen today, with comfort levels akin to that of modern C-Class Mercedes, which is probably the ultimate compliment. With almost 1.9 million 190Es being sold across the 11 year production run there are plenty of cars on sale today. With that in mind, some examples have been run into the ground and you should stay away from them. However, don’t be put off by well cared for high-mileage examples as quite often they just require a quick service and a clean up to be good as gold. Here’s what to look out for when buying one. The biggest culprit areas relating to issues with the body are the jacking points, which are known to rust over time. It could well be that the rust is bad enough to require welding so make sure you have a quick look underneath the car for rust spots as well as in the wheelarches, boot floor and boot wells, as all of these are known to rust. Rust in the boot could be caused by a faulty bootlid seal or the drainage pipes from the sunroof as these can become detached, causing water to leak from the rear down into the boot. Cars with body kits may be hiding some surface rust so try and check the tops of the arches and inside the lip of the arch for rust. Also, check the bottom of the wings for damage; if the front has been fitted with the AMG/Cosworth front end, make sure it’s not been damaged on speed bumps. The usual checks for car park door dings and various other light damage should be taken. While doing this, make sure all the panels line up and the gaps between panels are equal and up to Mercedes factory standard. This could be hiding previous accident damage that the owner hasn’t revealed. Try and check all seals relating to doors and windows as they are known to let water in over time; this is particularly important with the sunroof. Whether the car is fitted with a manual or an automatic box, both are known to be strong and long-lasting so any signs of anything else should start ringing alarm bells. Firstly, the manual box is a little notchy but should change gear smoothly without needing real force. If the gear-change feels a little sloppy or stiff it may point towards worn gear linkages or failed bushes. The whole drivetrain should be smooth with no unusual noises or vibrations. Likewise with the differential; it shouldn’t whine or produce odd noises. Knocks coming from the drivetrain could be a sign that the prop couplings need changing. The automatic box should be smooth with no knocks or rattles, both changing up and down without too much hesitation. It is an older box, so don’t expect it to be razor sharp and it can be lazy at times especially in economy setting. The unit is programmed to start in second gear, but if you plant your foot the car will change down to first and then up to second. This can be overriden by moving the lever to ‘3’ and back to ‘D’ again before pulling away. If the changes feel sloppy and violent it could be a sign that the transmission fluid needs changing. The standard setting of the gearbox (identified as ‘S’) holds on to the revs for longer and will kick down more sharply than economy mode, so make sure this responds as it should. Some cars were fitted with the optional extra ASD, which is an electronically controlled hydraulic locking differential. If the instrument cluster displays an ASD light area the car is fitted with one. Check to make sure there are no leaks from the differential. All petrol engines should idle at around 700-800rpm with no lumps or coughs. The 2.3-16/2.5-16 Cosworth engines will idle at between 900-1000rpm and have been known to have a slight rattle known as cam clatter, audible on start up from cold. If this rattle is excessive it could be a sign that the timing chain may need changing. If the car isn’t idling correctly it could be that the idle air control valve (IACV) is faulty – which is common – and make sure you check for any vacuum or air leaks in the rubber hoses around the induction system. Check with the owner as to what servicing the car has had over the years. Engine oil should be changed yearly, or two yearly at an absolute push. While on the test drive the car shouldn’t have any hesitation with regards to pulling off and then all the way to the redline. The 2.6-litre is a reasonably swift car, so if the car seems sluggish something is amiss. Cars built after 1992 will feature a catalytic converter that you may not have considered. Check for any rattling when the car is revved and any drops in performance could be down to a clogged-up cat. The chassis is a good mixture between firm and soft, so the ride shouldn’t be crashy but it also shouldn’t be so soft that it bounces. The rear arch should sit a few inches from the tyre; anything less could point towards sagging springs or a leak in the optional self-levelling suspension. It could also point towards aftermarket springs with a lower ride height. The springs on all models are prone to cracking, so if the car is sagging in any corner, it will most likely be a broken spring. On the whole, the W201 190E is an extremely comfortable car that leans on the side of bounciness over road undulations. With that in mind, if the wheel scrubs on the wheelarch liner when travelling, the springs are too soft and should be replaced. It’s a smooth car that can travel at huge distances in comfort, but don’t expect a non-Cosworth model to be an out-and-out sports car. The interior should relate to the claimed mileage. The leather seats are prone to cracking over time but with the abundance of refurbishing kits available this shouldn’t present itself as too much of an issue. If there are big cuts or splits then this is a more serious issue. Check to make sure all the electronics are working including the sunroof. If it doesn’t move forward and back it’s a sign that a cog in the motor has stripped or the sunroof cable itself has snapped. If the electric windows don’t work properly, then a common problem is a fault with the wiring between the pillar and door. This could relate to worn door seals that are allowing water to seep in and damage the wires or even the motor itself. Door cards are known to come away at the top but replacement parts are easy to get hold of so don’t worry too much. Have a look behind the door cards and if they are fraying look for more water damage or potential rust. Check the headliner for potential water damage from the sunroof. If damp is visible then the sunroof seals have worn. Due to the orientation, it is possible for the water to seep into the back of the pillar covers without detection until too late. While the water may not be visible, discoloration, humidity and a slight smell may point towards this issue. On the whole, the Mercedes 190E is a reliable car. Our sister title Mercedes Driver recently bought themselves a project 190E automatic in 2.6-litre guise with just over 190,000 miles on the clock for under £1500. Since then the cost of repairs has been under £500 with the car now running smoothly. Don’t be put off by high mileage examples, as these are Mercedes of the old school and engineered to a high quality. It doesn’t necessarily point to a car that has been unloved or is in anyway worse than a car with half the mileage. The biggest factor is to check the history; if the correct maintenance has been adhered to, the car will continue to run for years to come. As for preference, we would elect for at least a 2.0-litre variant in petrol or diesel. The 1.8-litre is a little underpowered for everyday use. In terms of either manual or auto, it depends on your use of the car; if you intend to use it every day, the automatic is a peach in traffic, but is a little thirstier than the manual. Both boxes are reliable with the right maintenance, so that shouldn’t sway your decision. Make sure you check for rust, as this could prove pivotal in your cost of ownership. In terms of prices, a budget of around £2000 will buy you a good 2.6-litre, late model 190E. Early examples that are in pristine condition will rise by £1000 or so but anything close to £5000 should be reserved for low-mileage, clean and brilliantly maintained examples. As for the desirable Cosworth models, these are worthy of a separate buying feature of their own: the Evo I example is more affordable at between £15,000 and £25,000 depending on condition. The Evo II model is the most collectable model and will set you back comfortably over £100,000 for any condition vehicle. 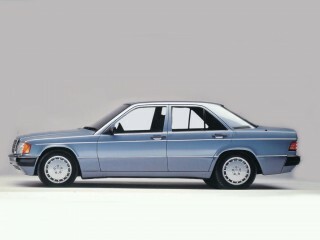 Straight-six 190E 2.6 was aimed at BMW’s 325i E30. Bruno Sacco’s sharp lines still look stylish today. Multi-link rear end gave the 190E W201 a handling advantage over the contemporary BMW 3-Series E30. Interiors are tough and can take a surprising amount of neglect. Automatic is smooth but can feel sluggish: it’s designed to pull away in second gear by default. Legendary Mercedes build quality means well over 200,000 miles is common.